One of the old University inside the Intramuros is Adamson University. What is the story behind this university? Why we can't see the old building of this university? Here some of the answer got from google. What history behind the Adamson Univesity? According to the blog site of Adamson University; The Institution was founded in 1932 by George Lucas Adamson, a Greek national in the Philippines, as a School of Industrial Chemistry and Engineering. 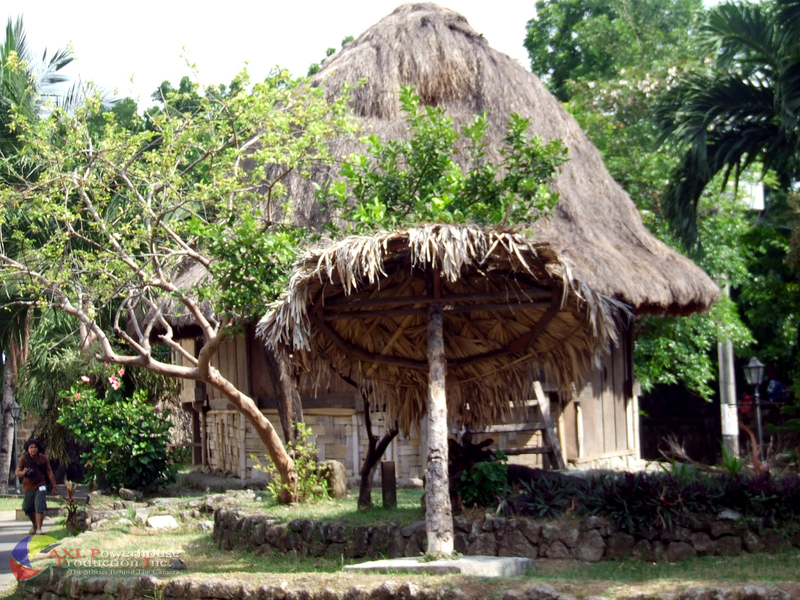 It was the first such school in the Philippines. The three Adamsons administered the school themselves: George Lucas was President, Alexander was Vice-President, treasurer and registrar, and George Athos was Dean of the College of Engineering. 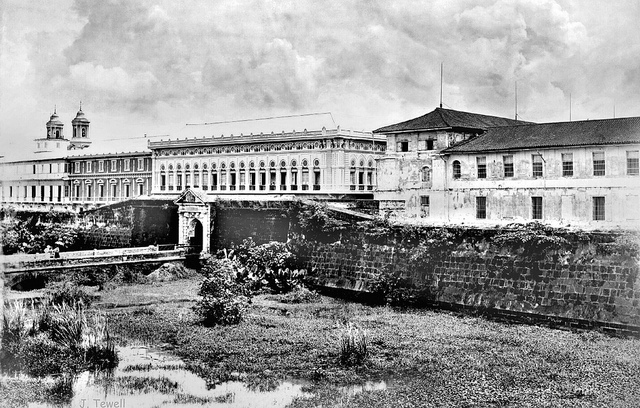 The first school building was located at San Miguel, then transferred to Intramuros, and during the war, to the E-building of Meralco. 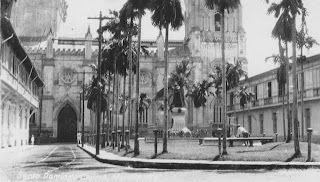 Before finally settling on its permanent home along San Marcelino Street in 1946 after the war, the school had three different locations: Sta. Cruz (1932–1933), San Miguel (1933–1939) and Intramuros (1939–1941). In San Marcelino, the university expanded with the acquisition of the Meralco building in 1968 and the St. Theresa's College-Manila campus in 1977, both adjacent. And here the now of Adamson University - Intramuros. 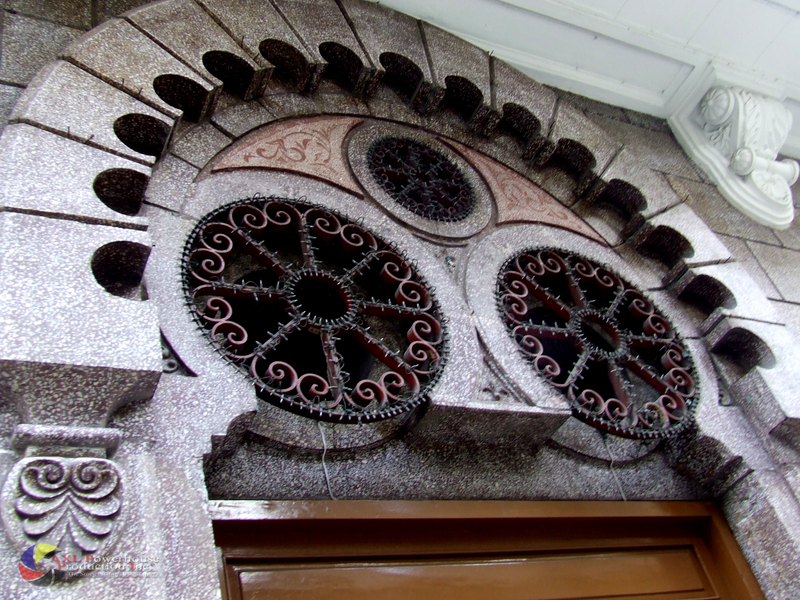 What was the structure that was built on Adamson building? 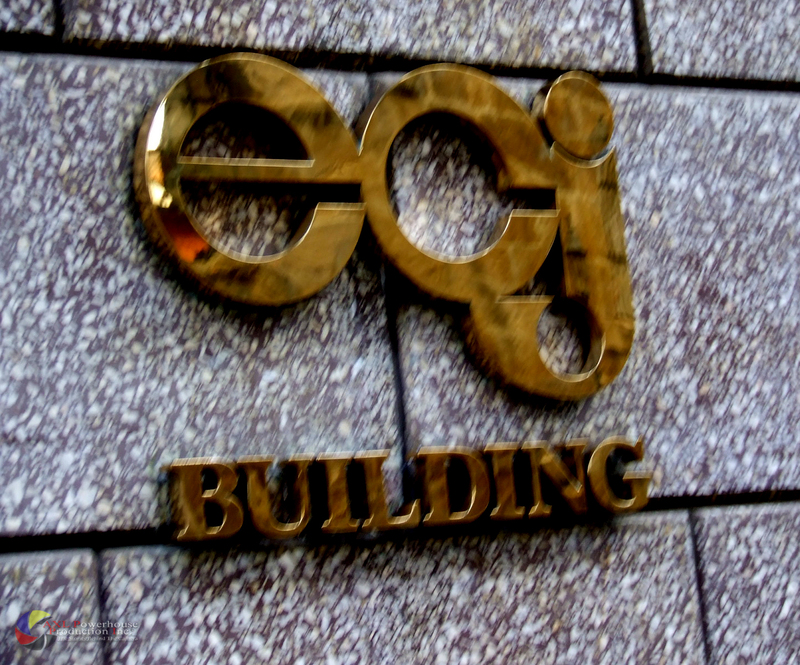 Its the ECJ ,ECJ means Eduardo Cojuangco Jr. Here some of my some of ECJ Building. The Augustinian Provincial House and the ECJ Building (Adamson University) on Sta. Lucia Street. Old Photo Credit to the respected owner. One of the oldest church inside the Intramuros, Sto. Domingo church. 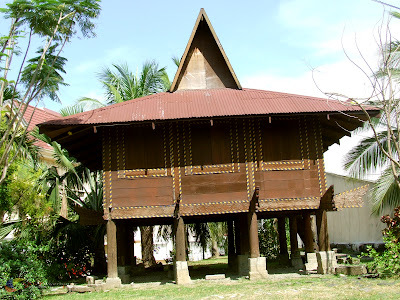 What is the History behind this church? 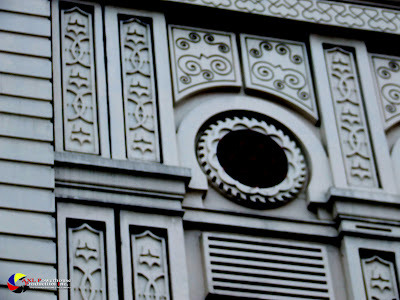 How this church influence the people inside the Manila? Here some of the answer i got in the net and ofcourse in my reasearch inside the Intramuros. 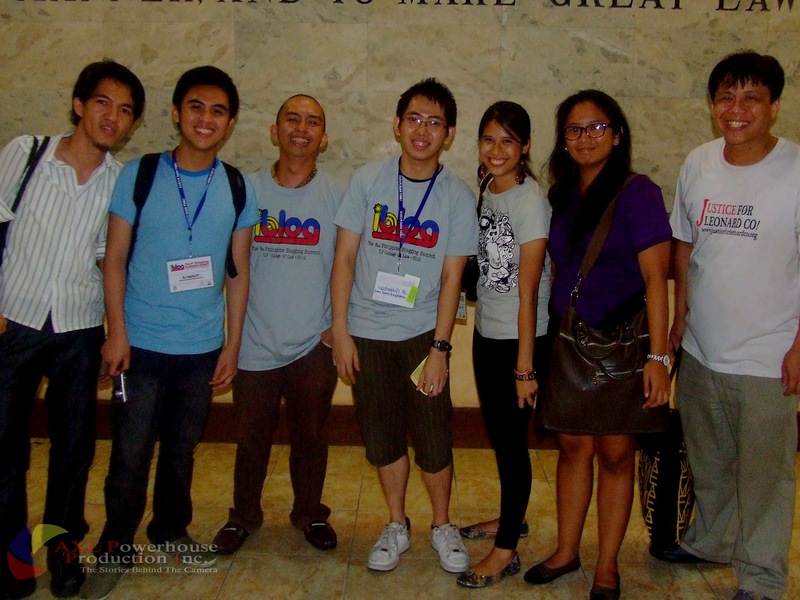 According to the Intramuros blog site ; "The Sto. 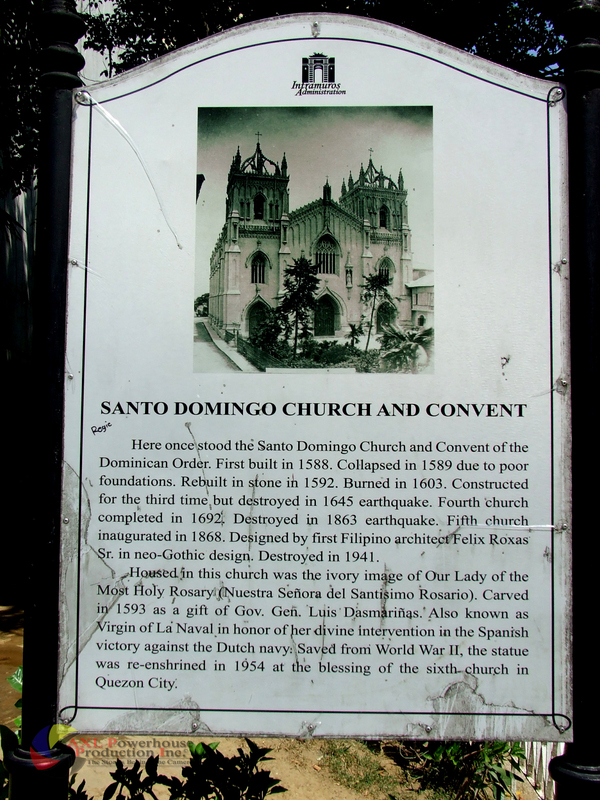 Domingo church was built on a site near the University of Sto. 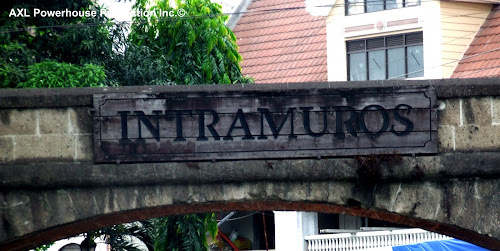 Tomás University, that is, on the northeastern flank of Intramuros, near the Pasig. On this site, four other churches had been built; the fifth and last of the Sto. 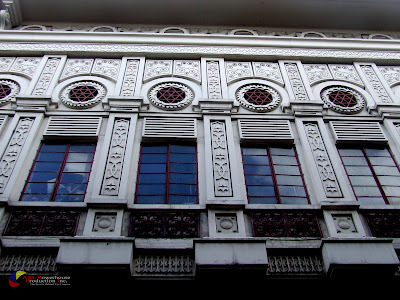 Domingos was in the Neogothic style, designed by Felix Roxas Sr., with construction supervised by Fray Sixto and Fray Ristoro. This was the church damaged by Japanese bombardment on 21 December 1941. Arriving in 1587, the Dominicans were welcomed by the Franciscans. 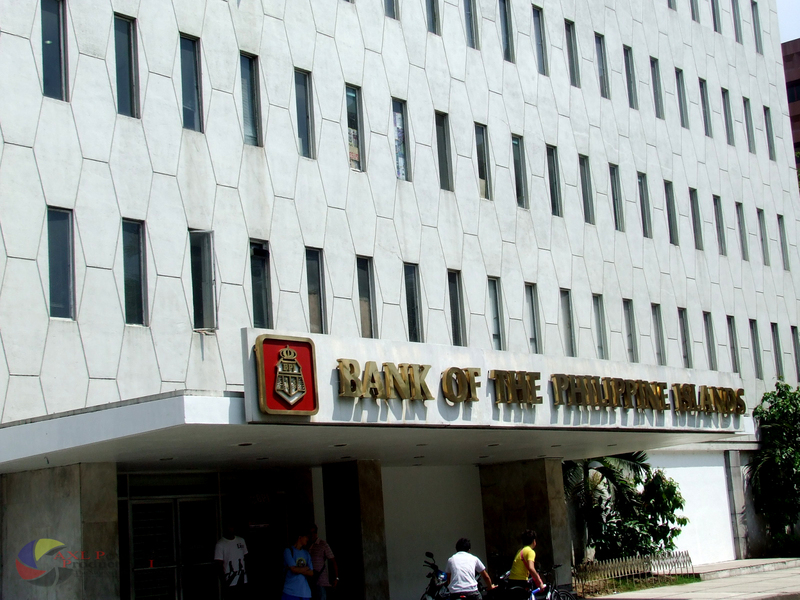 Bishop Domingo Salazar contributed 300 pesos toward the purchase of land and 3,000 more for construction. On 6 August 1587 ground was broken for a church of light material. Completed on 1 January 1588, the image of the Sto. Rosario was enthroned in the church. 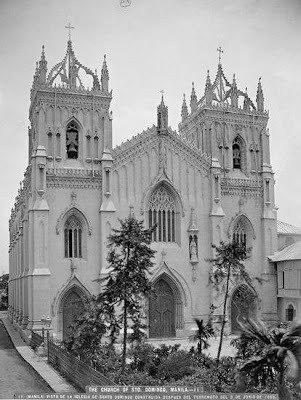 In 1589, the church’s roof collapsed compelling the Dominicans to build a second church of stone inaugurated on 9 April 1592. This church burned during a fire on 30 April 1603, which consumed a third of the city." To read more about this article click here. 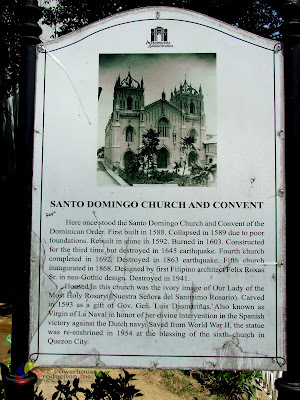 According to some historian "The Santo Domingo Church was the Mother Church of the Dominican Order in the Philippines." And this church was the home for the legendary Marian image of La Naval. After the war, the Dominicans built a new Sto. Domingo, designed by Jose Maria Zaragosa in the Spanish Moderne style, along Quezon Blvd. 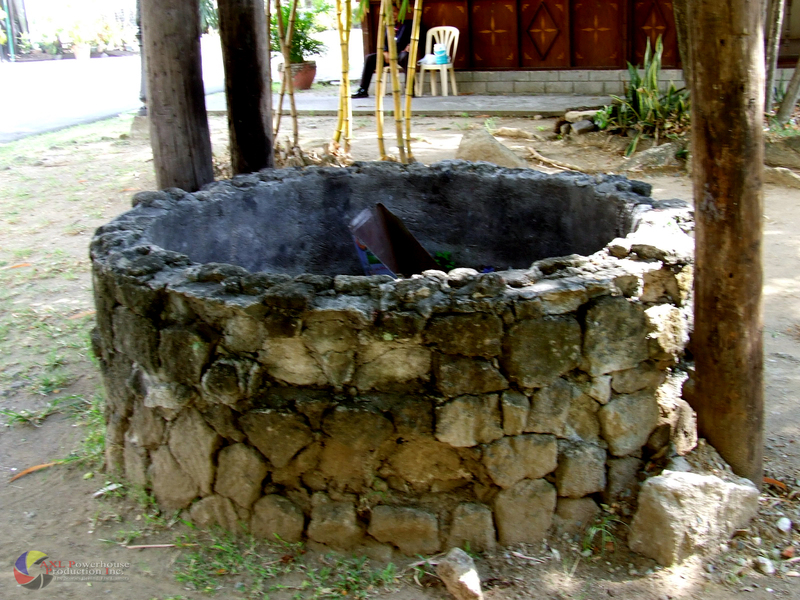 in Quezon City. This capacious church houses the image of the Sto. Rosario, whose feast is marked by the La Naval procession. The BPI bldg was formerly the Far East Bank Bldg before BPI acquired FEBTC. iBlog 8th Philippine Blogging Summit (Day2), akala ko di ako makakapunta dito dahil may isang event ako na dapat puntahan kaso nga lang walang sumagot sa aking text kaya naman mas inisip ko na lang na go na lang ako sa iBlog 8th summit mas madami pa akong makikilala at di nga ako nagkamali ang dami ko nakilala esp sa Proudly Pinoy Bloggers o mas kilala bilang PPB. 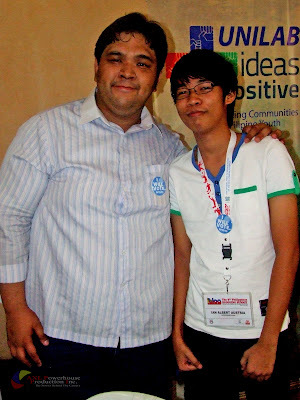 Simula natin ang araw sa unang speaker na si Mr. Rem Tanauan tungkol sa Soul Blogging. 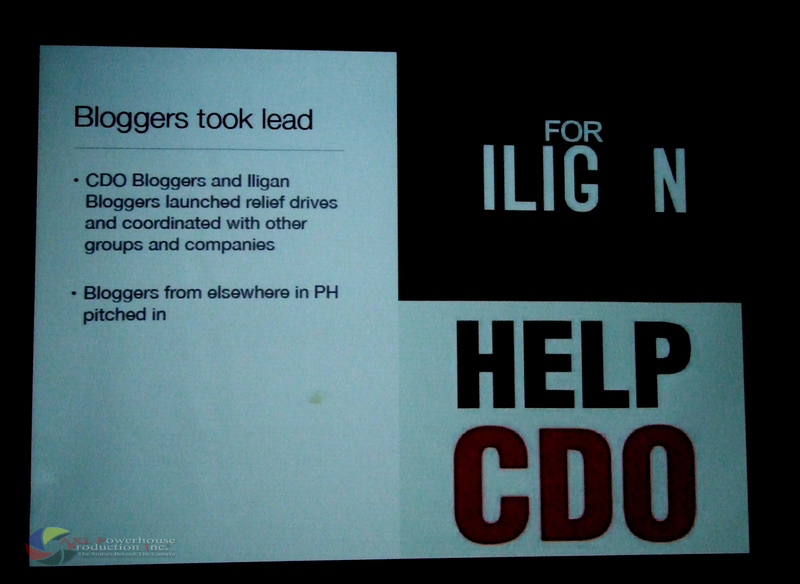 Base saaking pagkakaalala sa topic na ito, simple lang naman yun eh bakit ka magblog? sinu ang inspiration mo? 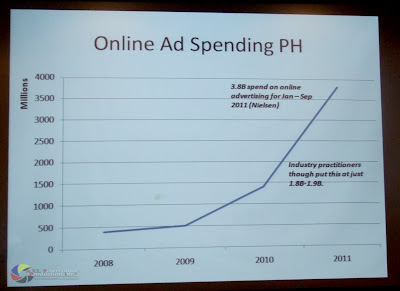 pag-nagblog ka ba pera kaagad ang nasa isip? 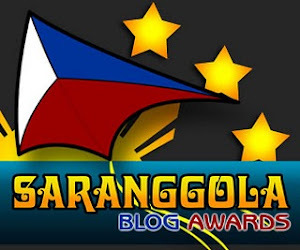 di ba pudeng you blog because you want to inspire other people. 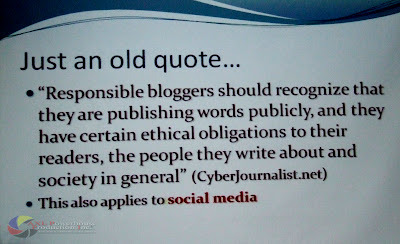 Sabi pa nga ni Sir Rem, meron tatlong process of blogging, una Inspiration, ikalawa Insight ikatlo Intention. 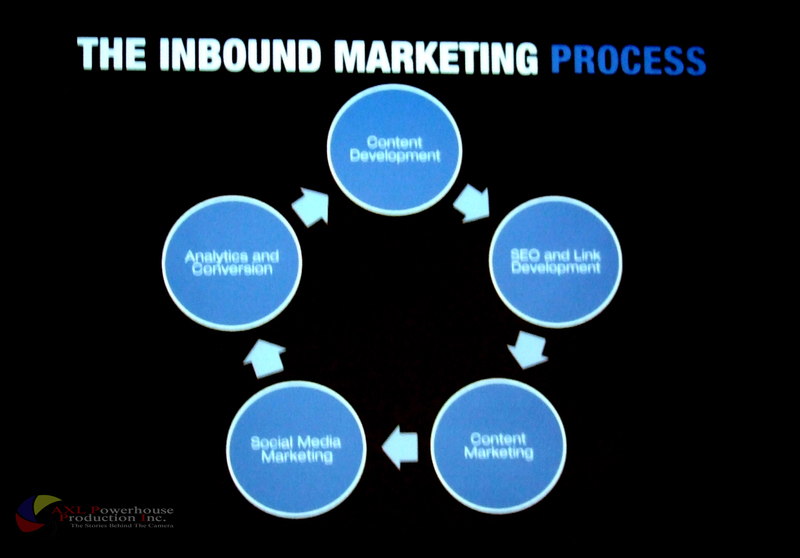 Blog marketing,paid blogging and social media consultants competition. 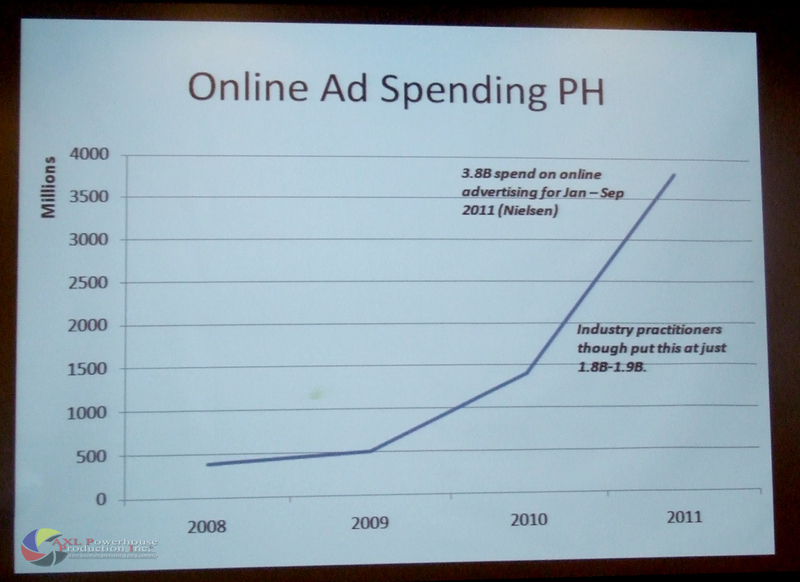 At isa sa mga iniwan niyang tanung sa amin ay "Influence or To be Influencer Online?" After niya mag speaker its Breaktime at ang sponsor ng food walang iba kung di ang Mcdo, isang masarap na chessburger and OJ. Syempre habang ng breaktime, time to mingle naman with the other bloggers kwentuhan kung anu-anu mga natutunan at dapat pa naman gawin. 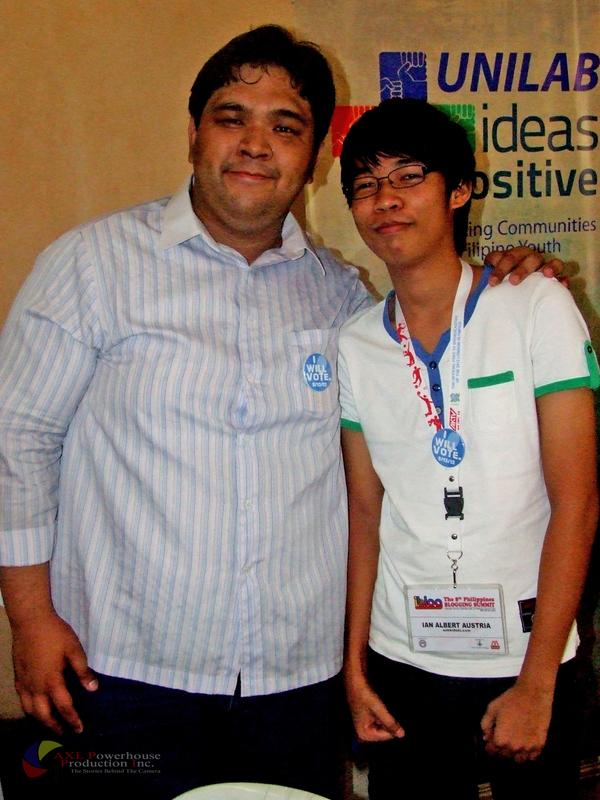 After the breaktime, time to back sa summit para sa next speaker. The next topic naman ay ang Blog Writing Panel sa pangunguna nila Wendell Glenn Cagape, Bien Eli Nillos at Marcelle Fabie. 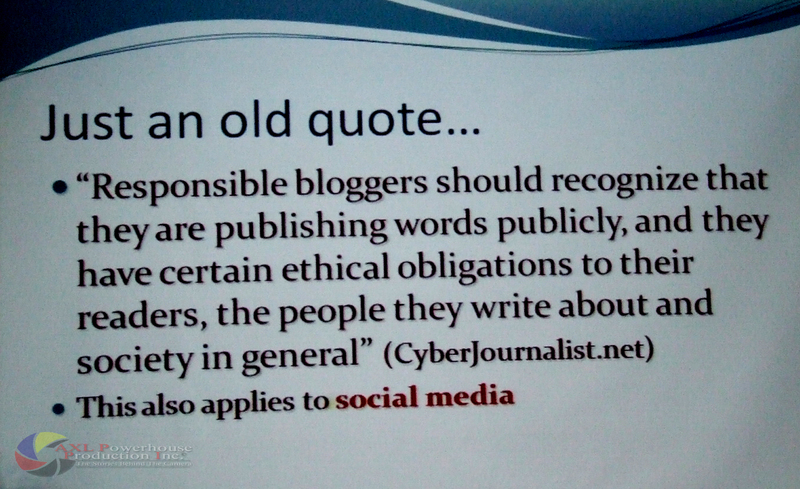 Simula natin ang topic tungkol kay Mr. Wendell Glenn Cagape ang Making your blog post work: Inspiring Quotes and Posts. Narito ang ilan sa mga subtopic nanidiscuss niya. How does your post inspire you? Inspiring post? Are there anything near it? Always remember : The heart echoes more than the mind! How Inspiring Quotes does work? One of the line that he say was "In the end, your blog speaks of what you are inspired by each day. 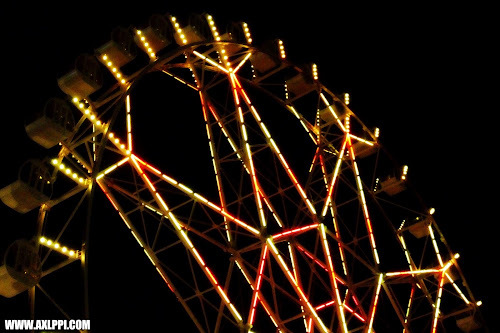 It is your trademark, your fulfilled dreams!" 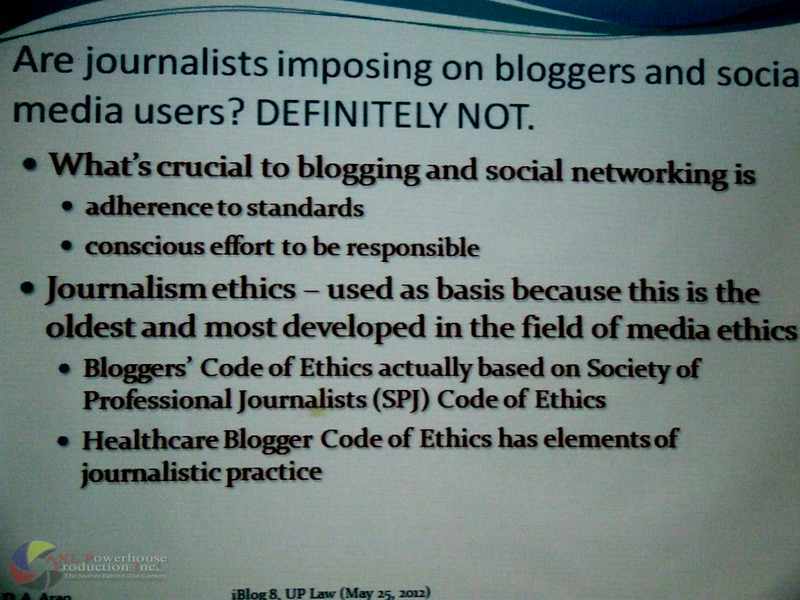 Sumunod naman sa kanya ay walang iba kungdi si Mr. Bien Eli Nillos ang topic naman niya ang about Using Public Narrative In Blogging. 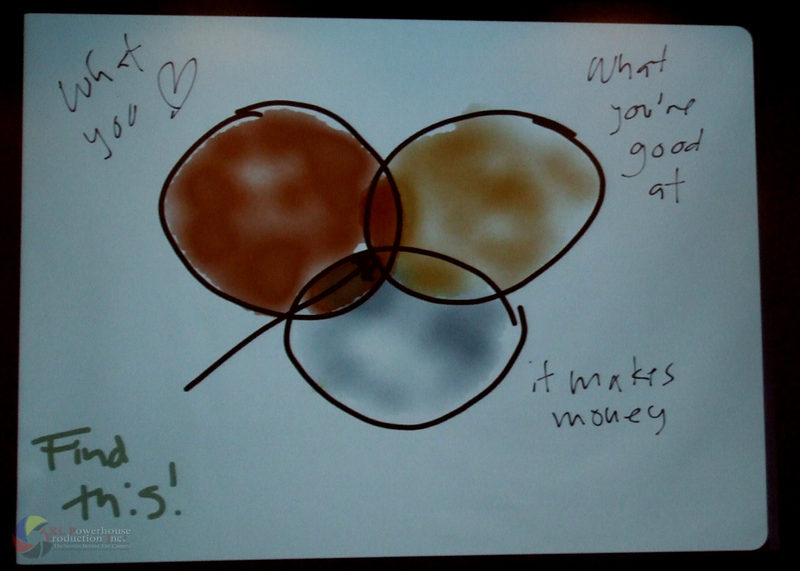 How we FEEL about something influences what we THINK and what we DO! How to use stories to attract and engage more readers to your articles,books and newsletter. The last panel speaker is Marcelle Fabie of the best speaker siya ang mas lalong nagpabuhay ng hall, he talks about the Blog comedy writing for the not-naturally-funny. Nagbigay siya ng mga 8 pointers about how to make a humor blog to really funny. After nito Lunch time na, sponsor ulit ng Mcdo this time isang masarap na yummy chicken meal with apple pie! 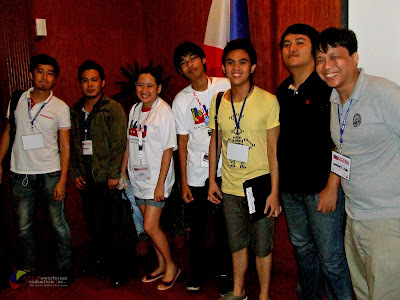 syempre di mawawala yung mingle with some bloggers ulit! Ang dami namin pinag-usapan esp sa part ni Sir Marcelle Fabie, kaso bitin yung time ng lunch break 30 mins lang kumpara yung day1 na isang oras. 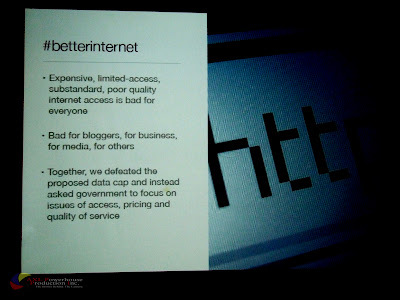 After lunch pasok ulit sa summit room for the next topic. Speaker si Mr.Noel Feria about the Teaching and Learning through EduBlogging. Here some of the subtopic he discuss. Blogging as a process of reflection. 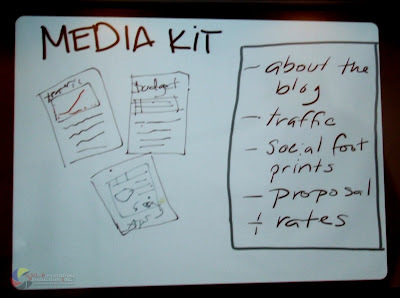 Blogging is a way for knowledge and skills sharing. 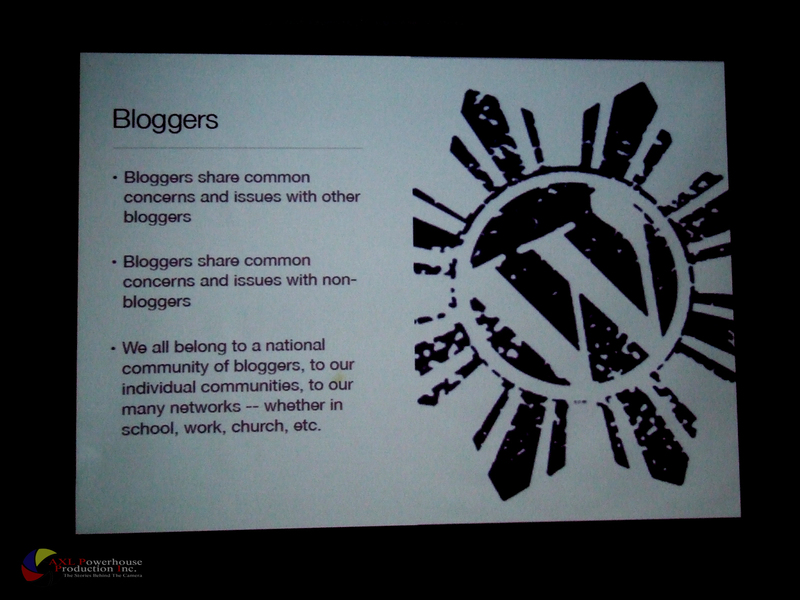 Next topic about the How to make your blog stand out from the crowd by Victorino Q. Abrugar. 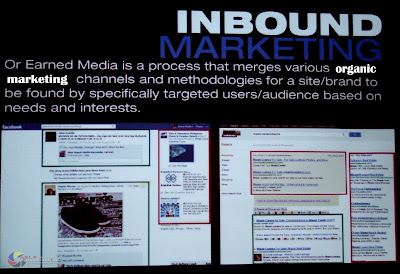 Connect (Don't just focus on the media in the "social media", but focus on the social - the people). 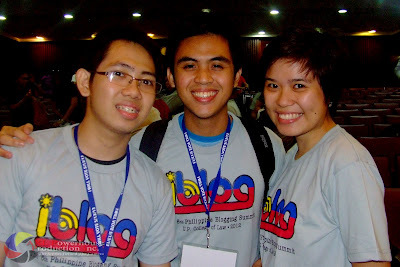 And then ito na ulit and Social Media Panel sa pangunguna ni Carlo Angelo Gonzales,Jeoffrey Solas, at Grace Bondad Nicolas. Simulan natin Carlo Angelo Gonzales, he talks about Social Media Marketing Shiznit. Here some pointers he share on us. 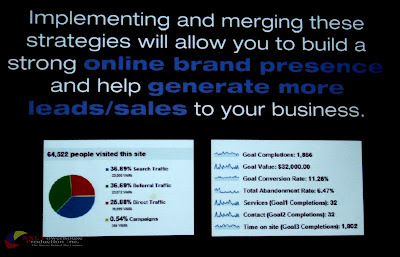 Provide value on your post. Always provide a call to action. 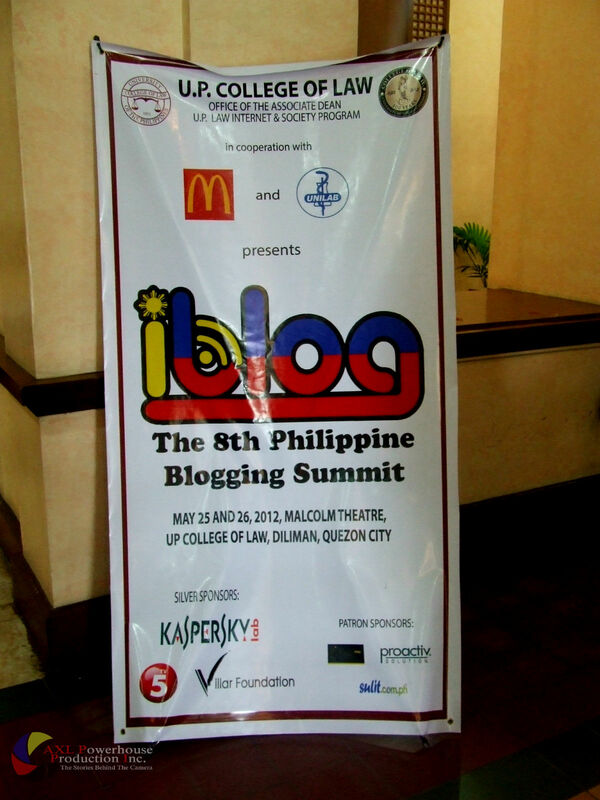 Next speaker is Jeoffrey Solas talks about the Optimizing your Blog thru Social Media. 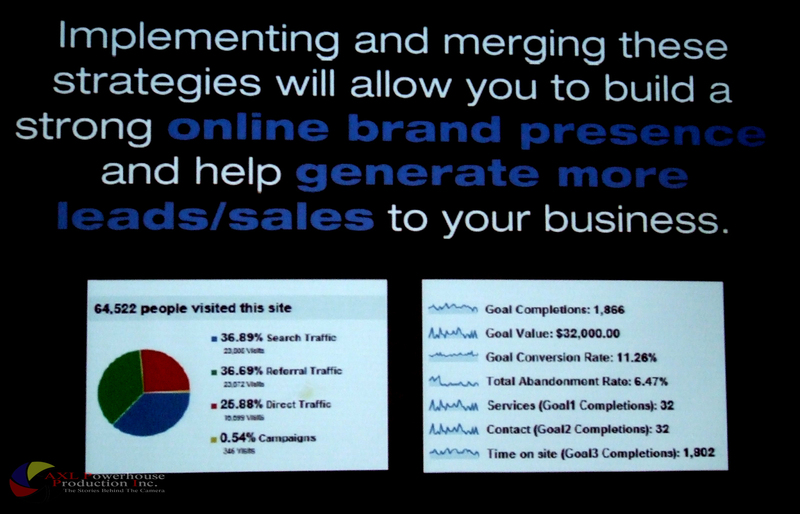 Using Hashtags, tags, and keywords. 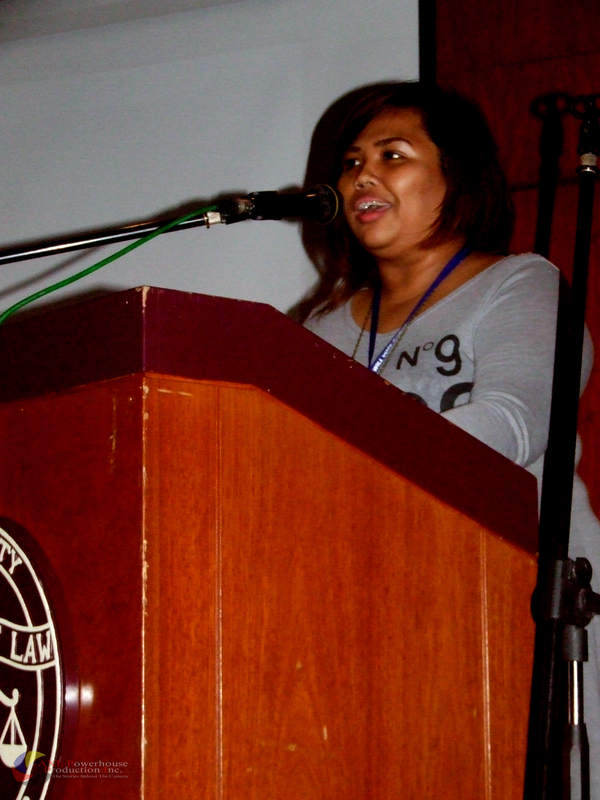 Next speaker is Grace Bondad Nicolas, the topic about the Social Media in Business and Advocacy. She talks about how she start blogging and what the life before social media and life after social media and ofcourse how she engage the blogging to business and to her advocacy. After this one breaktime ulit, mula ulit sa mabait na food sponsor Mcdonald, the yummy cheese burger and OJ! 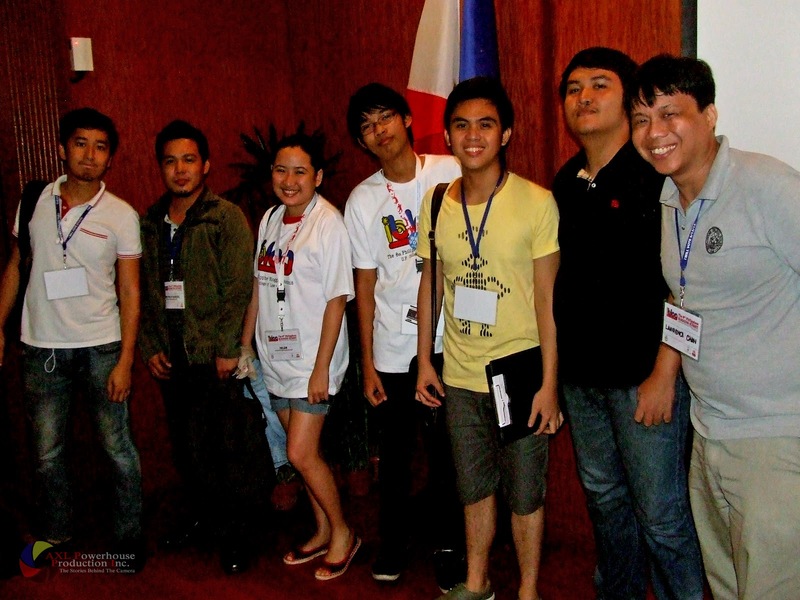 Then mingle again withe bloggers and picture sa mga speakers! After that pasok ulit sa loob for the next topic. 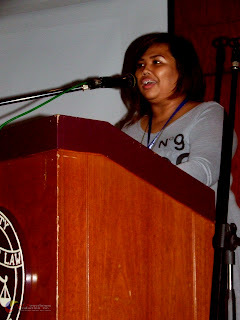 The topic about the Social Media Legal Issues by Atty. JJ Disini. This topic is really help me a lot, sobra-sobra lalo na pagdating sa Exclusive Rights (Copy,Modify,Publish and Derivative works), isa rin sa mga topic niya ay ang Infringement VS Plagiarism, Use of pic w/o consent VS Use of pic to claim work of other. 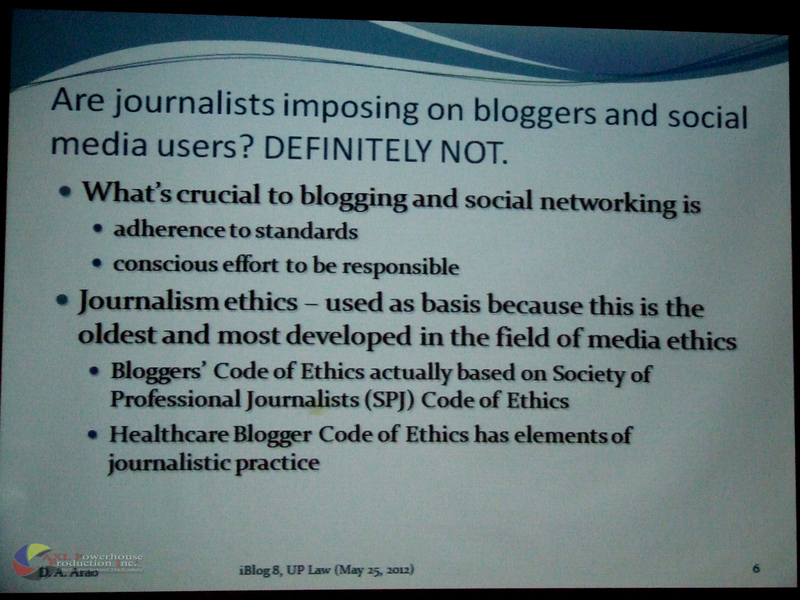 The topic about the Increasing Health Information Access through Blogging by Nurse Alvin Cloyd Dakis. 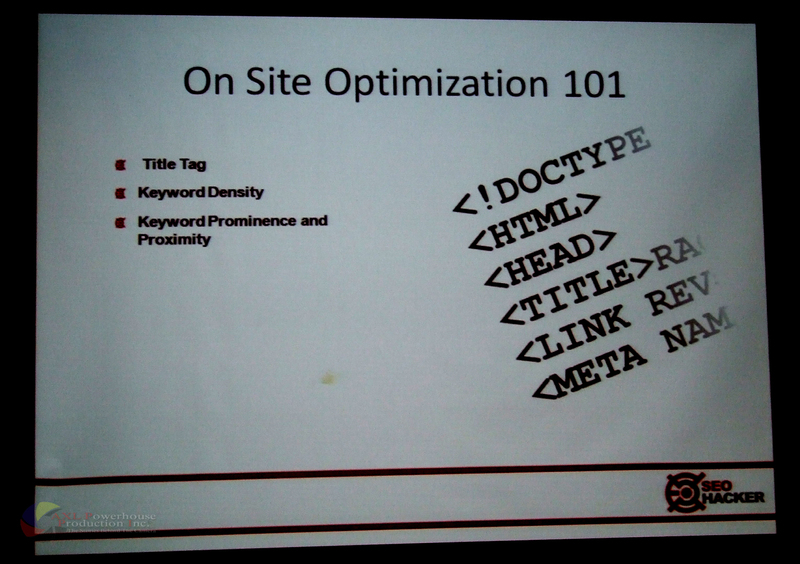 Here some of he pointers that he discuss. 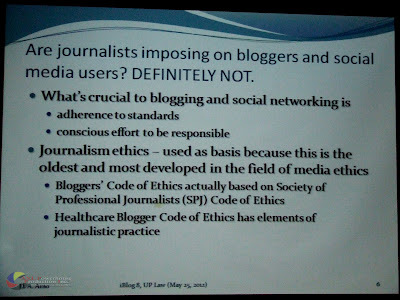 Who can do health blogging? What health blogging is NOT. After nito syempre bawat pagtatapos ng mga speakers may question and answer portion, di ko na ilalagay kung anu-anu pa yung mga tinanong nila masyado na tong mahaba. 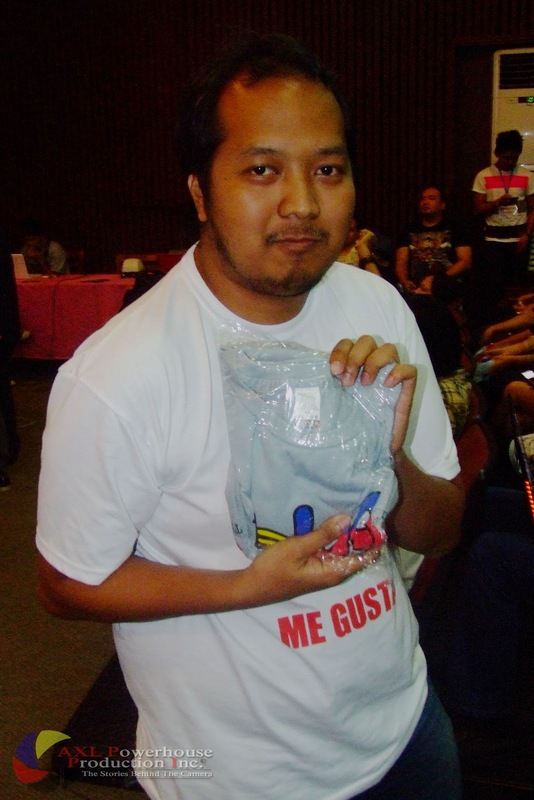 After nun ang pinakahihintay ng lahat ang raffle ng mga prices lalo na ang iBLOG Tshirt. 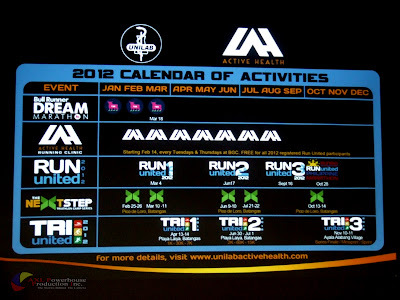 Grabe ito ang hinintay ko ang raffle syempre lahat ng mga kilala kung mga bloggers meron tshirt pero syempre masaya na din ako dahil nanalo rin ako sa raffle, akala ko di ako mananalo eh, i got a Active Health bag and vitamins from UNILAB. 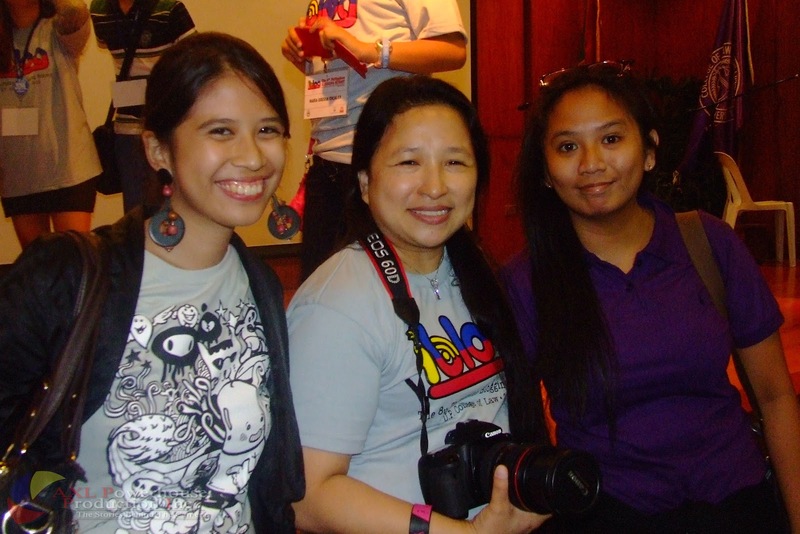 Here some of my Bloggers friends na nakakuha ng tshirt at syempre pictures with the speakers na rin. Oh before i forget iBlog8 happen last May 26, 2012 at Malcolm Theater, UP College of Law, UP Diliman, Quezon City from 8 am to 5 pm. I hope makita ko kayo sa next Iblog Summit! iBlog 8th Philippine Blogging Summit (Day1), ito ang aking unang pagpunta sa iblog, madalas ko na ito marinig noon at gusto puntahan ang kaso lagi na lang sablay kasi lagi akong may events, pero this time wala na! Thanks for that! Kaya naman dadali ako nagregister para makakuha ng slot. Hindi ko na sasabihin kung anu pa yung ibang detalye ng Day1, gagamitin ko na lang ang aking mahiwagang larawan para doon, maipakita kung anu-anu ang mga nadiscuss ng day1. 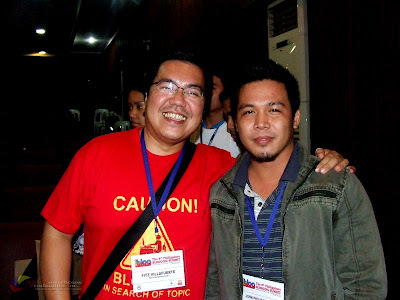 Unang speaker si Sir Carlo Ople, ang kanyang topic ay tungkol sa Unboxing the true potential of your blog at kasama na dito kung paano makakakuha ng direct advertisers and investors sa ating blog. Narito ang ilan larawan sa kanyang discussion. 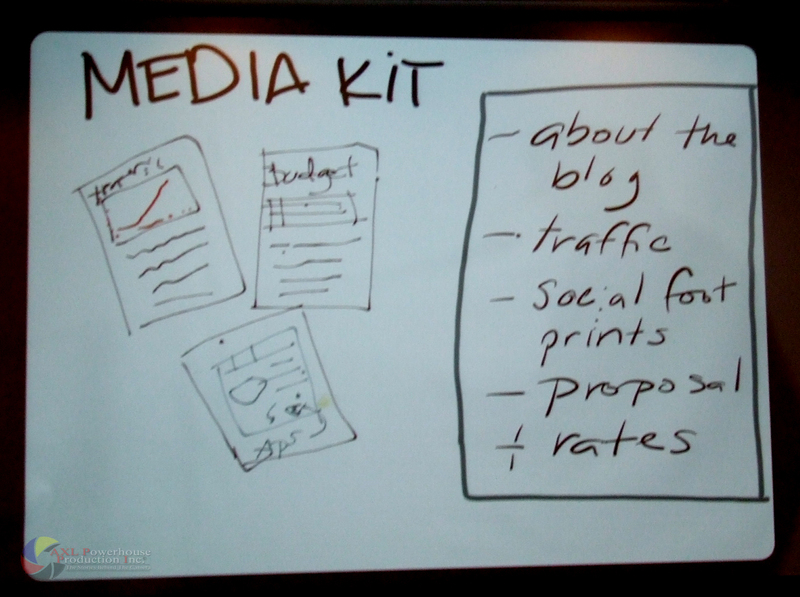 What you need to bring to advertiser? 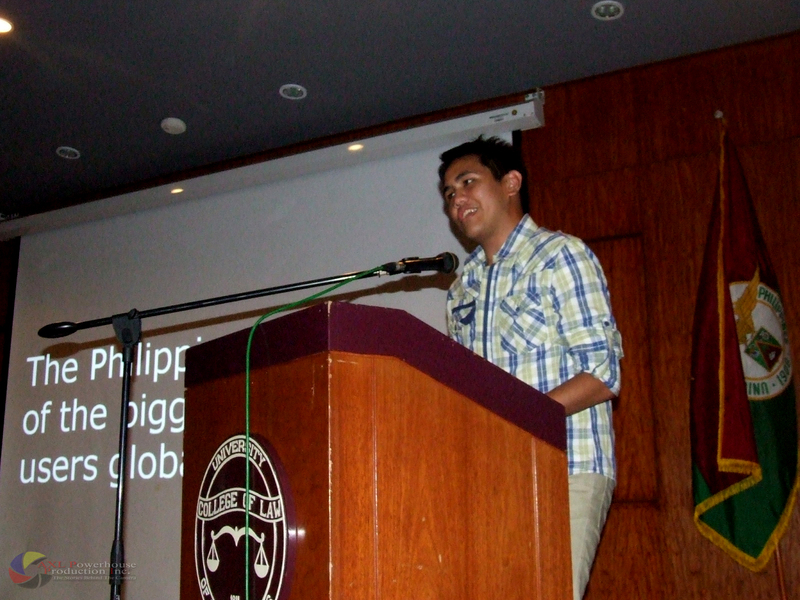 Second speaker si Mark Joseph Delgado, he talks about the Creating a Blog Activation Campaign. 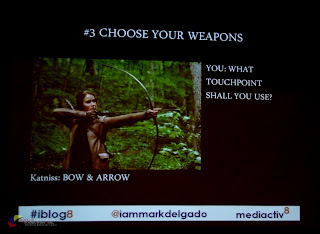 He compared Brand Activation to the famous and 'best selling' book, Hunger Games, for the Best marketing tools. (Hunger Games) Katniss: To save her sister. (Blog) Know what your goal. 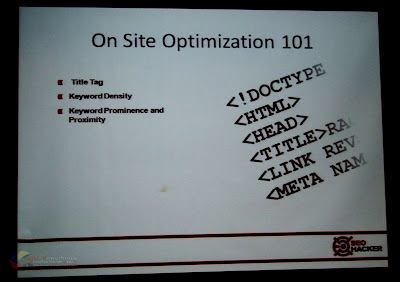 (Blog) What concept can you create that rooted o your subject's branding? 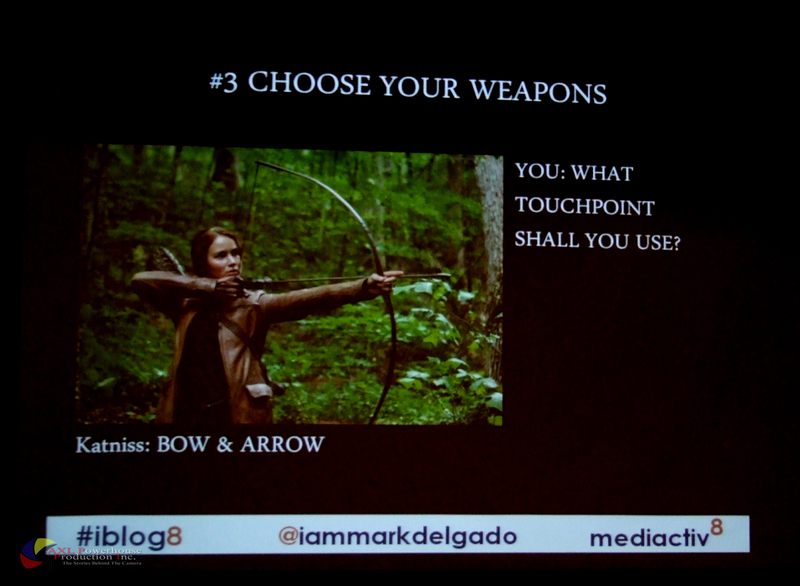 (Blog) What touchpoint shall you use? (Blog) Who is with you? (Hunger Games) Katniss: defying the odds. (Blog) What difference can you make? Third Discussion about the SEO and Social Media Marketing Panel discuss by Sean Patrick Si, Jason Acidre and Kim Tyrone Agapito. Inbound Marketing – Merging SEO, Social, Content Marketing, Conversion Optimization and Online Branding by Mr. Jason Acidre. 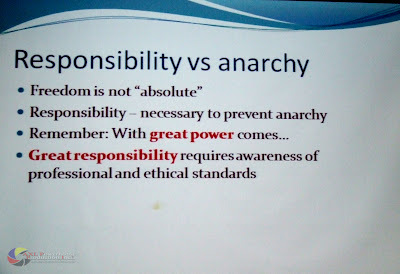 Here some of the subtopic he share. Words of using by 3 percent. He ask the bloggers what is really important in blogging QUALITY or QUANTITY? Actually its my 1st time na makinig sa SEO, why because i want to explore more how to make a more traffic of my site, honestly I learn about a lot on this topic esp about how Ammunition of Internet War. After the lunch time we go on UP field to do some photoshoot, but i will post that as soon as possible so just wait for it and of course mingle with some bloggers! And we back in Malcom to continue the summit. The discussion about the what difference can you make? 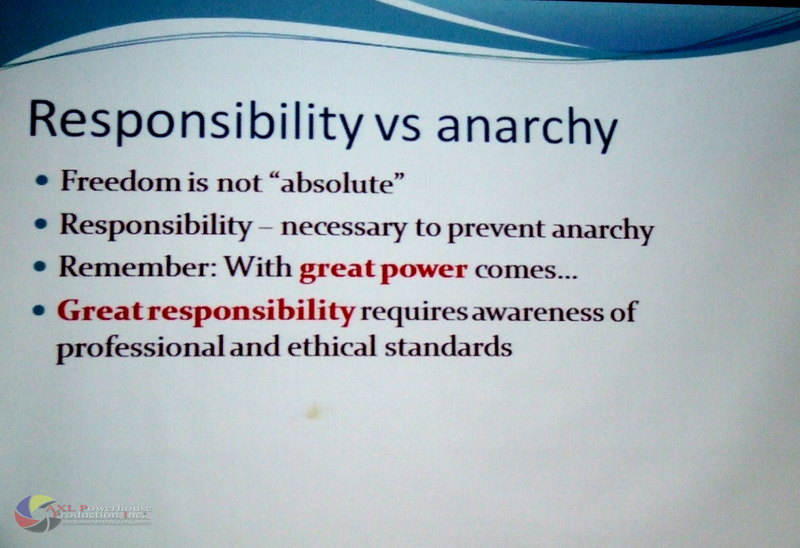 He talk about the Responsibility vs anarchy: Is there such a thing as “borderless” freedom? 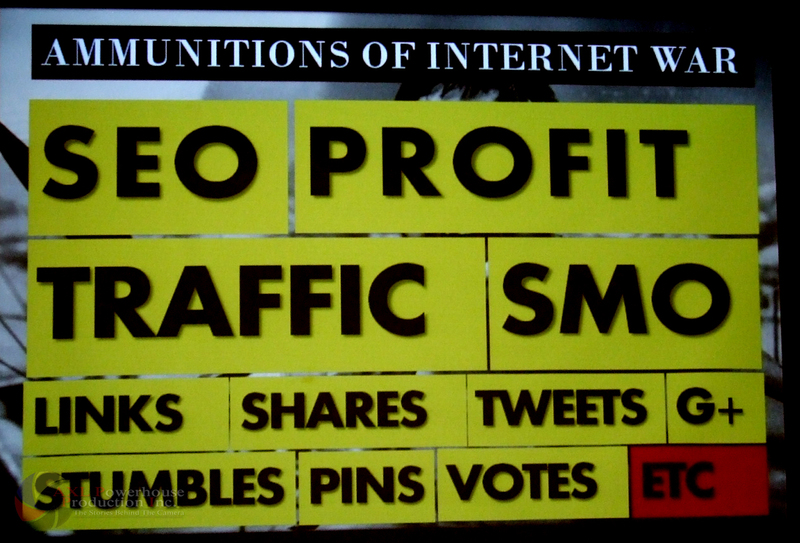 Next Speaker is Mr.Tonyo Cruz topic about The Social Media and Social Change. I shall do my research well on the subject matter before I put up my blog post online. I shall not commit any act of plagiarism. 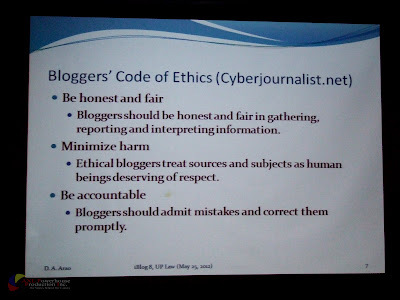 I shall show respect to fellow bloggers, blog readers, companies, PRs or any individual who wishes to connect with my blog. 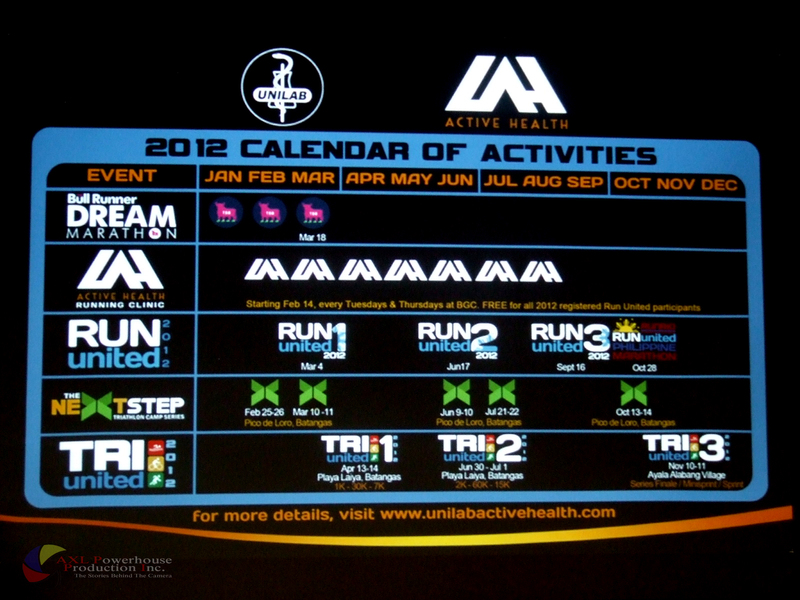 I shall blog about an event I have attended if I'm invited and came as a blogger. I shall give my honest thoughts on products,issues and topics I would be blogging about. I shall be accountable for all the things I put up and write about in my blog. 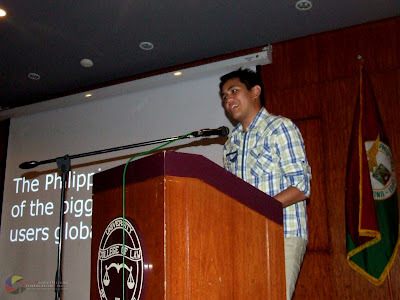 Next speaker no other than my friend and my co-Helios Lloyd Salac , he talks about the Youth and Blogging: The Next Generation Bloggers Are Here. 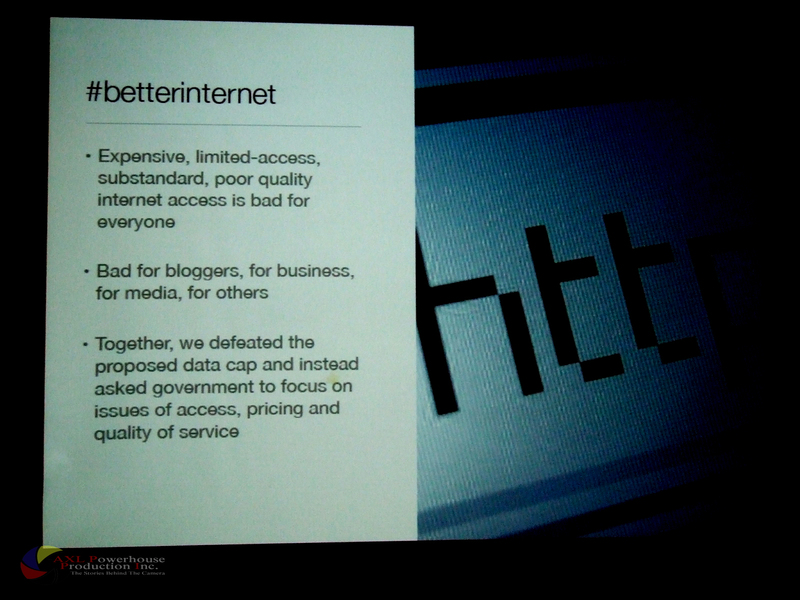 Here some of the subtopic he talk. 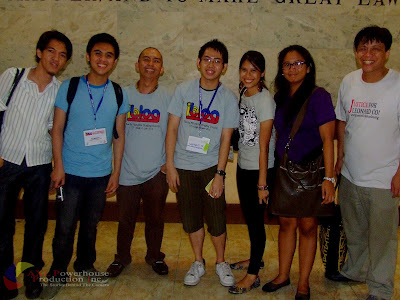 And here some of the scene after the Iblog day 1..
One of the oldest and the first Jesuit University in the Intramuros, the Ateneo Municipál de Manila or also know now as Ateneo de Manila University. Anu nga ba ang kasaysayan ng unibersidad? Paano nakatulong ang unibersidad? 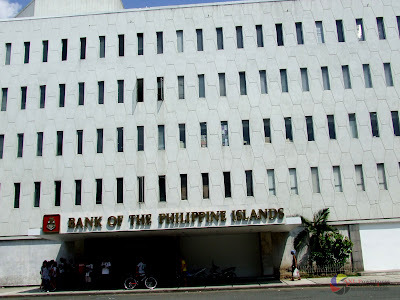 Sinu ang mga promeninteng to na nag-aral sa paaralan na ito? Anu na ang itsura ng unibersidad ngaun? 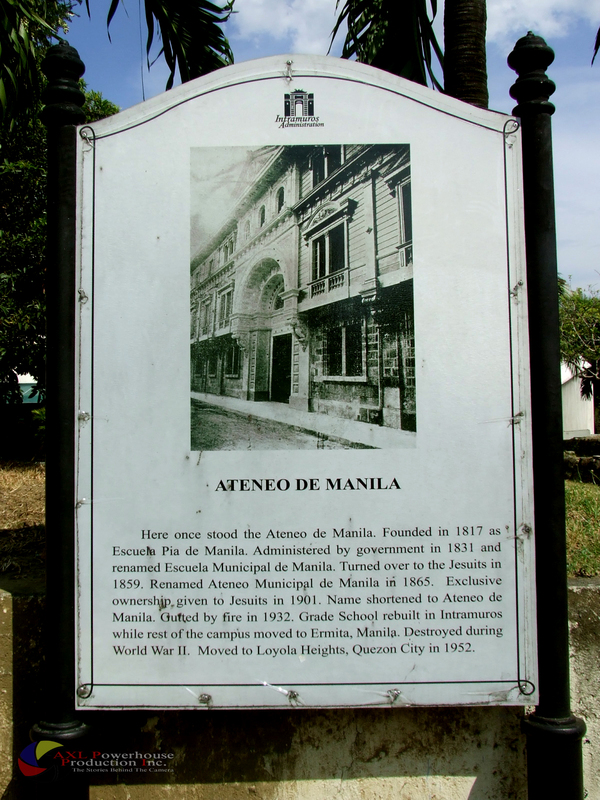 According to Intramuros Site ; Turned over to Jesuit administration by the city of Manila in 1859, the Ateneo Municipál was a school for boys. Initially, the Jesuits hesitated taking charge of the school as they were returning to the Philippines after more than eight decades of absence to take charge of the Mindanao missions. 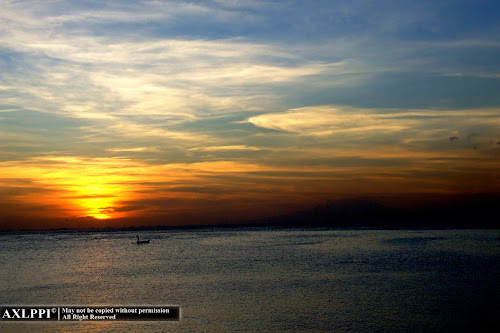 (The Jesuits were expelled from the Philippines in 1768). The instructions they received stipulated that they were to ask explicit permission from higher superiors should they commit themselves to education. The city council prevailed upon the Jesuits to take charge of the school then called Escuela Pia. With the necessary permissions secured, Fr. 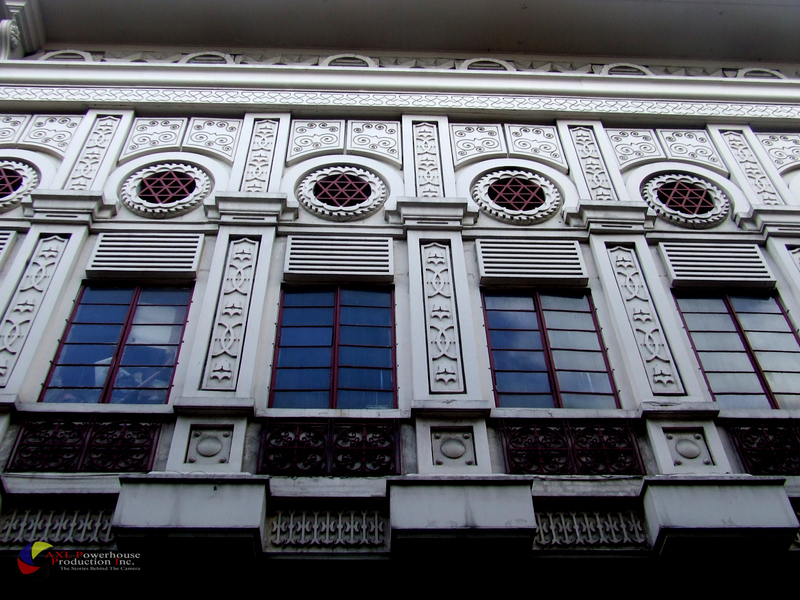 José Cuevas accepted the school and in December 1859, the Jesuits began instruction in a modest building along Arsobispado St. near the archbishop’s residence. 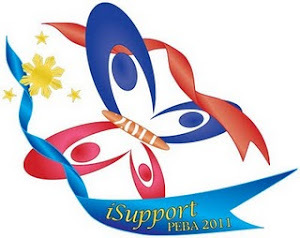 Founded and supported by the city, the school was allowed to bear Manila’s coat of arms. The institution began as a boarding school but started accepting day boarders. 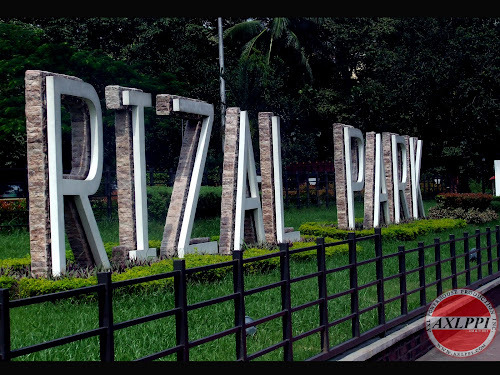 Her illustrious alumnus, José Rizal, began his studies as a day boarder and only in his second year did he become an interno or boarder. 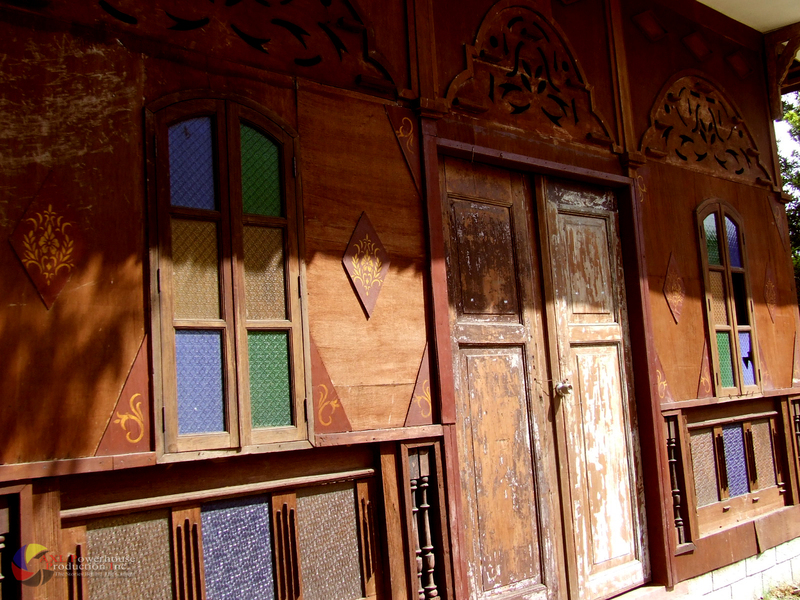 This school was later expanded with the addition of a preparatory college that prepared students for studies in the university, offering such courses as pre-law, surveying and mechanics. 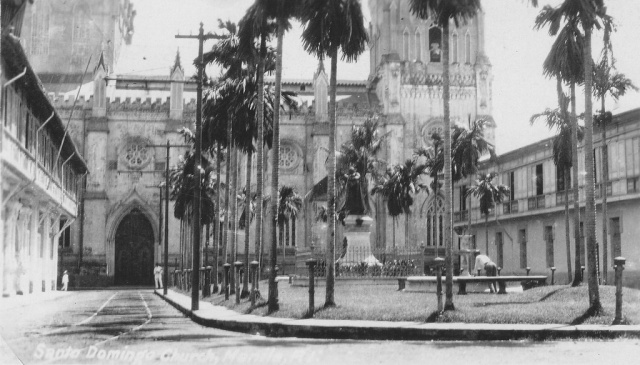 From 1879-1888, the college church of San Ignacio was built beside the Casa Mision and on a piece of property cut from the archbishop’s own garden. 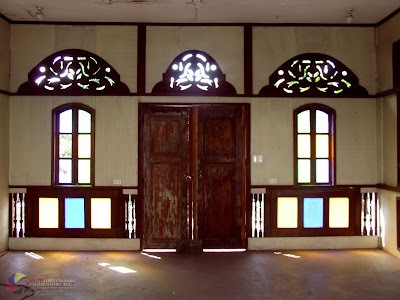 The city council allowed the Jesuits to build a bridge over Anda to connect the Casa Mision, which was their residence with the school and dorm. 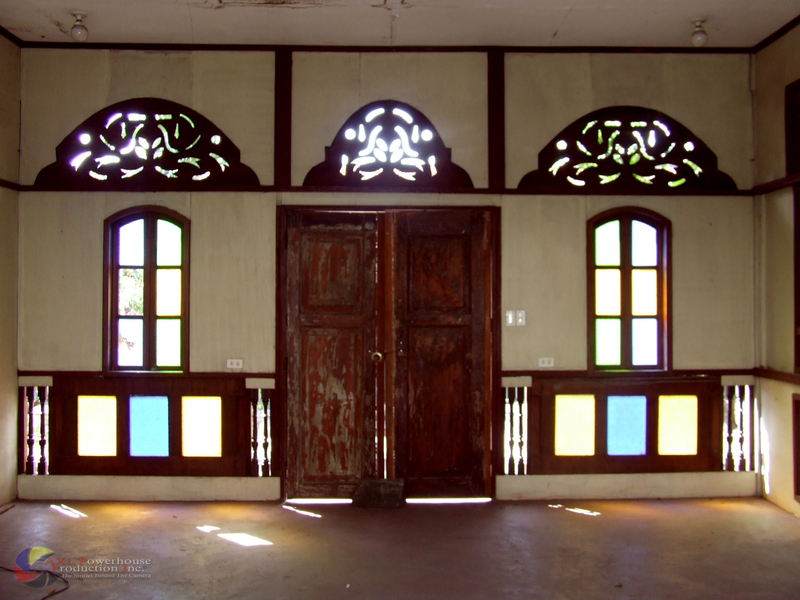 At the turn of the century a third floor was added to the school buildings and in the early 20th an elaborate entrance was designed and executed by Isabelo Tampingco. 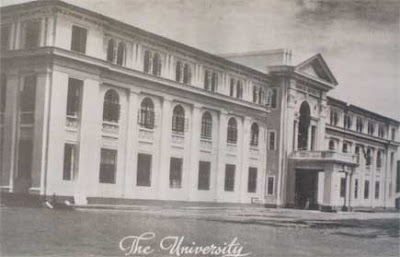 A fire that ravaged the southwestern quadrant of the city in 1932 damaged the Ateneo. The fire occurred at night, and the student boarders and the Jesuits had to save as much as they could of the Ateneo. 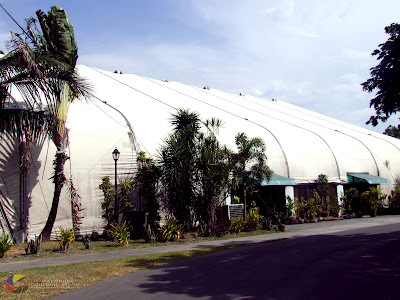 The student boarders moved to Ermita, where the Jesuits had built the Escuela Normal de San Francisco Xavier for the education of teachers and had transferred the Manila Observatory. During World War II, the Ateneo moved its quarters to different parts of the city while trying to maintain a semblance of normality. By the end of the war, the buildings at Ermita, along the road now named after the Jesuit founder of the Manila Observatory, Fr. Federico Faura, was in ruins. 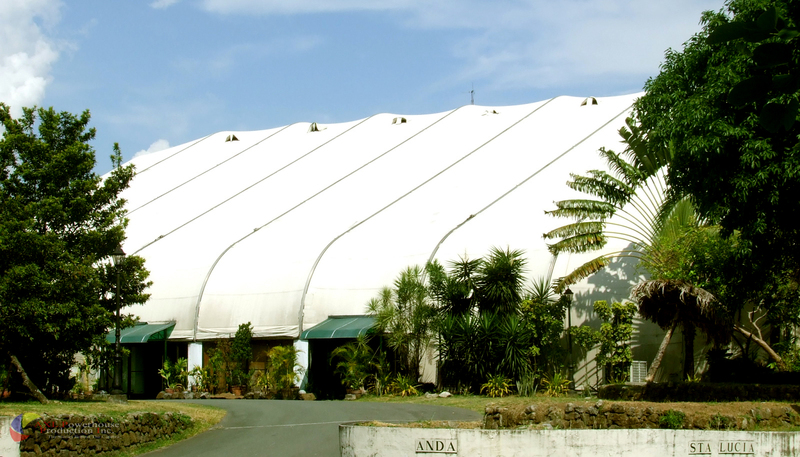 In 1951, the Jesuits transferred the Ateneo to Loyola Heights, in Quezon City, where it has remained. In 1959, Ateneo became a university. 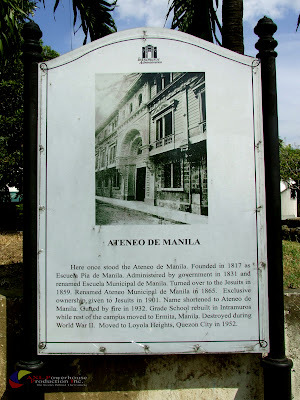 The Ateneo archives in Quezon City preserves documents and pictures relating to the Ateneo in Intramuros, among them are award-giving programs which list prominent Ateneo alumni of the Spanish era like José Rizal. A Tampingco screen saved from the San Ignacio church, decorated with carvings in the round of acanthus leaves and braided rope, is in the Ateneo’s Rizal Library. Here some of my shoot at Ateneo Municipál de Manila.